Cash: Cash increased primarily due to income from my job. But I also got some cash from selling stock and selling an extra car my wife had. We also spent a good chunk of money landscaping our yard and insulating our home. Stocks dropped because I sold off some stock in my employer that I'd held. Retirement : I've got retirement funds in a 401k, employer pension account and Roth IRA account. My retirement is almost all in equities. The stock market rebounded nicely in 2009 so I'm up considerably. Home : The value of our home is flat overall for 2009. Earlier in the year it went down then it started to go up. It peaked at $241k in the summer after hitting a low of $218k in the early spring. Rentals : Our rental properties went up overall. Cars : My wife had an old used car that we ended up selling. The car actually sold for about $1800 rather than the $2500 that we'd estimated the value at. Home Mortgage : We have a 15 year mortgage on our home and we pay $800 a month extra towards the principal. Towards the end of the year I upped that to $900 a month. So over the year we've paid down over $16k on the home mortgage. Rental mortgage : We have a 30 year mortgage on one rental property that we pay the normal minimum payment on. That mortgage is being whittled a way a few hundred a month. Retirement rebounded by 36% growing by about $31k. Real estate assets climbed modestly. Mortgages were paid down by about $20k. 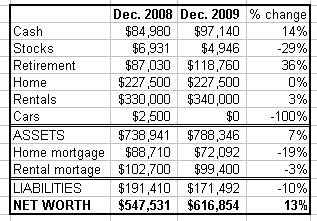 These are all positive changes in net worth and in our annual net worth overview there are no real negatives that I see. Overall our net worth is up over $69,000 for the year. I'm of course very happy with this and hope that the trend continues in 2010.